Digital effects are not a new thing, but mostly they simulate analog effects using analog type techniques, or at the other extreme the experimenters make sounds that reveal the limitations of digital processing. We appreciate both approaches, but use new algorithms that are impossible or impractical in the analog world, while keeping the warmth and power of analog sounds. 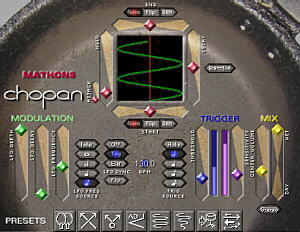 Since the use of virtual interfaces is still new in the history of music machines, special attention was given to the GUI . Containing all the features of the EDP, the Echoloop puts a whole new world of possibilities under the control of just a few virtual buttons. The only looper specifically designed so that your music can grow organically as you play and listen, and the only looping device designed with the input of a whole community of creative looping musicians over more than a decade. Each plug-in the the Chop-Plugs range uses our Level Independent Attack Detector (LIAD) code that detects the attack of notes incredibly quickly. In the studio, Chop-Plugs produce effects that are synchronised to the feel of the music. The ultra fast response times mean that Chop-Plugs are ideal for live use, using low latency pc/mac, or the new vst supporting hardware devices. The central graphic display give a real-time indication of how the control settings interact, this makes it much easier to understand how to set up the sounds that you want. Chopitch, a dynamic pitch down shifter for instruments with percussive attack, works without latency, and without the usual harmoniser type sound artifacts. An amazing remix tool, totally transforms any beat. All the usual panning effects, and a whole lot more. Using our LIAD technology the plug can synchronise to the beat, and apply spatial processing to each note, in a variety of patterns. With many additional options to synchronise to the tempo of your music as defined by your vst host, Chopan takes an old idea and gives it a new lease of life. Up and coming is Chophiltre, an autofilter with similar controls to Chopan, that's finished and just waiting for us to sort out the purchasing system. There'll also be a delay plugin with a totally glitch free varispeed, that working great and just needs a GUI. Then there's the new pitch shift algorithm that Andy worked out for the hexaphonic plugins...watch out for a stereo/mono plugin. One of the problems faced by guitar effects designers is that in a regular guitar the sound from all six strings is mixed together. The answer is to use hexaphonic pick-ups so that effects can trigger cleanly, and the timbre can be modified without intermodulation distortion. 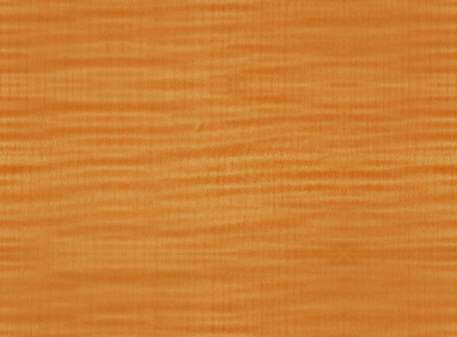 Rolands VG8 does an amazing job but still only scratches the surface of what is possible. Mathons plan to release multichannel effects with string priority technology. Mathons' Matthias Grob has been involved with the PARADIS hexaphonic guitar since 1984. 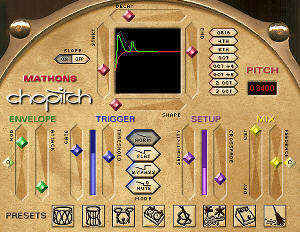 MORE INFO on using our polyphonic plugins for guitars with hexaphonic/divided pickups.